Savor the sweet life in Santa Claus, Indiana! Santa’s favorite treats couldn’t fit in just one store. Are you craving peanut butter fudge or maybe some candy cane popcorn? 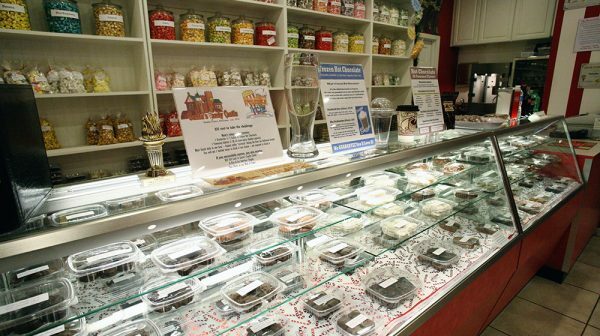 To satisfy your holiday sweet tooth we have compiled a list of five places to get sweets and treats. Explore Santa’s Candy Castle for all of the wonderful gourmet treats this family favorite has to offer, including caramel corn, delicious peppermint bark, more than 30 flavors of hot cocoa, frozen hot chocolate, and much more. The Santa Claus Christmas Store has special sweets that make Santa’s eye sparkle. There’s eggnog fudge and gumdrop fudge, what else can there be? Add your favorite cookie or a sweet and creamy hot chocolate while your browsing through nearly 5,000 ornaments. Pineapple-banana shake, banana split boat, and reasonable prices. What’s not to love about Scoops Ice Cream in Rockport, Indiana. Frosty’s Fun Center is family fun for all… this unique location has an arcade inside the restaurant. And of course, mouth-watering ice cream of many flavors. Some like cake cones, others prefer waffle cones. Either way, stop by the Ice Cream Shoppe inside of Stone Ridge Station to have ice cream the way you like it. Convinced yet? No matter the temperature outside, it’s always a good day to experience one (or all!) of these unique places… click here for local business hours to see what is open while visiting.